The increasing demand for M&E has fostered a surplus of resources on the practice of M&E, but much less on training others in M&E. Furthermore, much of the existing literature on the topic is rather academic, with little discussion of practical pedagogy. We wrote a book on M&E training to help address this, and this post draws from the book to summarize 14 key adult learning principles for M&E training, and brief tips to put them to practice. Adults are self-directed learners that bring to training past experiences, values, opinions, expectations and priorities that shape why and how they learn. In fact, whereas ‘pedagogy’ refers to the art, science, or profession of teaching, many use andragogy to distinguish an adult-focused alternative to pedagogy to emphasize that adults should be taught differently from children. The existing literature provides some information concerning a practical application component; however, there is almost no discussion of pedagogy or, more specifically, the selection of teaching strategies for a program evaluation course, (Oliver, Casiraghi, Henderson, Brooks, & Mulsow, 2008). Before I introduce the principles, a few explanations and disclaimers. While the literature on adult learning for M&E is slim, there is a wealth of scholarship and research on adult learning in general. The principles identified draw upon this body of information. The underlying rationale is not original, but we assembled and expressed the principles to highlight those practices for adult learning felt important for M&E training. Because the principles are about human learning behavior, they are not absolutes, nor are they exhaustive. They apply generally, but not to all people under all conditions – for instance, in certain cultures may prefer a more structured, controlled delivery of trainings than a fun and active format. Therefore, these principles should be adapted and tailored accordingly to specific training contexts. The principles are interrelated. For example, learning that builds on prior experience (Principle 4) can help ensure the training is relevant and meaningful to real-world application (Principle 5). Or that training that is fun and active (Principle 7) can support multisensory delivery (Principle 9) that allow participants to learn by doing (Principle 6) and sharing (Principle 10). The accompanying tips are only illustrative considerations to put principles to practice. In our book we provide many more examples, including 99 training activities organized into 21 categories that are linked with the different adult learning principle. One last point – remember that providing M&E training that makes a difference is more than just engaging facilitation during delivery. It requires a systematic approach with systemic attention to the larger system, or context, in which M&E training is both provided and to be used. This context includes the individual learners, trainers and delivery system, and the available resources and support for training and its transfer. 1. Establish a safe and respectful climate – Adults learn better when they feel safe and respected. Adults learn best in a relaxed and friendly atmosphere, where they do not feel threatened. Tension is not conducive to learning, and a comfortable person will learn more readily than one who is fearful, embarrassed, nervous, or angry. Adults may feel vulnerable learning new topics such as M&E, outside their ‘comfort zone’ where they are no longer in control. Therefore, M&E training should be structured to provide support and acceptance, and to reduce the fear of judgment. Adults bring ego to their learning interactions with others, and want to be valued and treated as an adult, not patronized or disciplined as can occur in child education. Good manners and courtesy is indispensable, and it is essential to establish rapport with and among trainees based on mutual respect and trust. It is important to cultivate a learning environment that positively acknowledges accomplishments, and to help “save face” and preserve self-respect (image) when mistakes are made. Explain how ground rules can be used in evaluation when conducting a focus group, and then use this topic as a springboard for participants to examine similar or different ground rules for the training – have them write them down and post them in a public space (flipchart) as a reminder that can be referred to as needed. Model responsible and respectful behavior as a trainer – that is, actively and carefully listen to questions, acknowledging and allowing for difference of opinion. Utilize individual coaching/feedback opportunities to establish rapport with trainees, connecting and relating to them as individuals. 2. Respond to the “need to know” (NTK) – Adults prefer to know what, why, and how they are learning. Adults are self-directed and their understanding and buy-in is essential for eventual ownership and use of the learning. For example, when individuals seek training on their own initiative (as opposed to training required at their workplace) they often devote considerable energy exploring the benefits before investing valuable time and money. Adults want ot take responsibility for their own learning and prefer to decide for themselves what to learn. Therefore, it is important that they understand the reasons for learning something like M&E, and how it will benefit them. Adults also want to know how the training will be conducted so they can better prepare for and participate in the training. Anticipate and answer the “So what?” or “What’s in it for me?” or WIIFM questions. Explain and show how M&E not only upholds accountability, but helps to inform decision making that can save time and money in the long-run. Make use of pre-training communication and an agenda/schedule to inform trainees about what to expect. 3. Provide a structured yet flexible progression – Adults prefer learning that is well-organized. As self-directed learners, adults learn better when they have a sense of direction of where the learning is heading. The trainer needs to understand and anticipate learning pathways to help ground the training, and then provide this ‘mental scaffolding’ to help adult learners organize and understand the interconnections between different M&E topics. It also helps them anticipate what is ahead, satisfying their “need to know” what is expected of them and what they can expect of the training. This can reduce anxiety, and empower them to assume more responsibility for their learning. However, it is important to remember that a well-structured progression should not equate with a rigid blueprint. It can serve as a road map, but there can be different routes to take you where you want to go, (and sometimes the ‘unexpected’ can take you right off the map). Therefore, it is also important to allow for flexibility and improvisation in training, accommodating emergent learning needs and opportunities to build meaning. As participants what they think are the key topics of a training in, for example, writing effective evaluation reports, and then use this to convey the actual progression of topics in the planned agenda. Periodically revisit the training agenda with trainees, (i.e. at the start of each lesson or end of each day), adjusting according to training realities and trainee needs. Introduce learning topics and objectives at in a consistent manner at beginning of each lesson, realigning it to prior topics and the overall learning progression. 4. Empower with genuine participation – Adults want to share full responsibility for their learning. Adults are independent learners and do not want things done to them, but with them. They need to be the origin of their own learning and may resist approaches that do not meaningfully involve them. Adults think independently, and learning is more effective when people are actively involved as partners for whom their opinions, experience, and knowledge is just as valid as the trainer’s. Participatory facilitation requires M&E trainers need to relinquish some control over the learning process. The degree to which this is possible will depend on the level of interaction the specific training delivery allows (e.g., live, in-person training versus asynchronous online training), but the more adults are treated as equal participants rather than passive recipients, the more likely they will be motivated to learn. Explain the importance of using questions in data collection to understand the program being evaluated, and that participants should adopt a similar approach to their learning. Delegate responsibilities in the training to the trainees themselves, such as conducting day reviews or energizers, managing a ‘parking lot’ for follow-up ideas, and presenting out on appropriate topics. Facilitate learning activities that are more self- or group-directed – i.e. have trainees facilitate a debate or role play on the advantages and disadvantages of different evaluation methods. 5. Incorporate past experience – Adults prefer learning that builds upon their prior experience. Adults bring a wealth of experience, prior knowledge, and priorities to learning that should be recognized and utilized as a rich resource and opportunity for training. They interpret new information according to their personal values and experiences. Therefore, adult learning should draw upon existing knowledge and experience. Adults will be more motivated to learn, and trainings more effective, it they can relate new knowledge to a familiar frame of reference, drawing upon their own experience. Conduct training needs assessments and preliminary trainee consultation that identifies prior M&E knowledge and experience. Consider sequencing M&E training topics from the known to the unknown, beginning with trainees’ existing knowledge and experience. Assist trainees to reflect and draw on past experience when problem-solving; i.e. while they may not have formally evaluated a program, related it to another way they have been involved in assessment, such as rating a dining experience at a restaurant. 6. Keep it relevant & meaningful – Adults prefer practical learning that meets their needs. Adults are ‘goal-oriented,’ and more motivated when learning immediately applies to their real world needs. They are problem-centered and interested in the immediate application of learning to solve problems relevant to their lives. Adults want to be assured that what they learn is worthwhile (value for money), and learning will be more meaningful when they see how they can realistically put it to use after the training. Consider sequencing M&E topics from the known to the unknown, beginning with trainees’ existing knowledge and experience. Invite an actual M&E professional into the training and have trainees prepare questions that they then ask them. Consider field trips to where M&E is being practiced, or show videos of M&E activities being performed (e.g., a focus group discussion). 7. Provide direct experience – Adults learn best by doing. Adults generally prefer hands-on learning with concrete experiences, experimentation and problem solving. They like a challenge, to roll up their sleeves and get their hands dirty. Experiential learning from trial and error reinforces the meaning and intensity of learning. It also helps to build practical skills, confidence and competence. Learning by experiencing is most effective when it is relevant to actual M&E situations encountered in the real world, and there is no substitute for learning from the real thing. For example, it is one thing to discuss how to design a project using a logframe, but another to actually design one based on a real life case study/scenario. Provide hand-on learning opportunities, rather than just observing, listening, and reflecting – for instance, have participants complete an M&E plan rather than just present on it. Encourage problem solving and experimentation, allowing trainees to trial and error, make and learn from – for instance, let participants work with a mobile data collection application on their phone and learn from their mistakes and each other. Utilize problem-solving activities such as actual scenarios – i.e. present them with a case study of a program for which they are to develop an evaluation plan. 8. Make it active, fun, and challenging – Adults learn more when it is engaging and enjoyable. A dynamic, pleasing learning experience teaches more than a routine or boring experience. As Mary Poppins aptly expressed, “In any job that must be done, there is an element of fun. Find the fun and, snap, the job’s a game!” Indeed, fun is not limited to children, and adults also learn best when they are enjoying themselves. Learning is more than sitting still and listening to a PowerPoint presentation, but should employ a variety of methods that make the learning more lively and engaging. However, fun does not mean less rigor. Active engagement and challenge are key ingredients that complement fun. Adults like to make demands of themselves and test their abilities. Learners of all aptitudes and abilities should experience an appropriate level of challenge, to enable each individual to achieve his or her potential. Why can’t this be fun too? For face-to-face training, keep people moving – when possible, have trainees get up out of their seats, i.e. role play obtaining informed consent for a key informant interview. Make learning into a game or contest – i.e. teams can be used and points awarded during question or review sessions; have trainees piece together a logframe puzzle, or match M&E concepts to definitions; etc. Switch seating arrangements or change working groups to encourage interaction with different people that can be more dynamic and interesting. 9. Use mixed/multisensory methods – Adult learners require a mixture of learning approaches. People learn differently, and therefore it is important to adapt and combine a variety of materials, mediums, and delivery methods that do not cater to one particular learning style. Some adult learners prefer to have information presented to them as a whole while others will want the details; some prefer text or speech while others want pictures and visuals; some prefer to learn by doing while others prefer to reflect before acting. Learning is multisensory, with vision recognized as most influential; therefore, it is good practice to include visuals as a core instructional method. However, adults learn faster when they are using two or more senses. A mix-methods approach to instruction can be multisensory, including visual, auditory, tactile, and kinesthetic methods. It is unlikely, in time as well as cost, to train in a way that satisfies everyone’s learning style fully. However, a mixed-methods approach is more likely to at least partly address individual learning preference. Just as evaluators may triangulate different data sources to get a more accurate understanding, so can trainers to cater to different learning styles – consider a questionnaire to identify their preferred learning styles as part of the pre-training analysis. At a minimum, incorporate visual aids to reinforce the spoken word and key learning points, as sight is the dominant sense used in learning – i.e. if the training is on using specific M&E formats or templates, provide them with real life examples, or if appropriate you can have them first design in small groups what they think should be in the template. Balance time spent in training for active methods other methods than listening and sight (e.g., debates, role play) versus reflective, self-directed activities (e.g., case study reading, note taking). 10. Differentiate learning – Adults learning is more effective when it is tailored to different learners’ needs. Rather than a ‘one size fits all’ approach, training should cater to different types of learners. This principle overlaps with others, but the emphasis on adjusting training to best meet the needs of learners who have different levels, abilities, and individual circumstances. Instruction can be differentiated in content, process, products, affect, and learning environment according to the students’ readiness, interests, and learning style. The goal of differentiation is to move all learners to a higher level of achievement. Differentiated learning is learner-centered, and is reflected in the other adult learning principles – for example, the use mixed/multisensory methods, and building upon learners’ prior experience. Below we offer some other considerations. Incorporate into training content examples and illustrations for both genders, different cultures, and varying levels of experience and abilities. Use smaller groups with mixed-abilities for less advanced learners take advantage of peer support, and larger group discussion for advanced learners to review and voice ideas. Provide materials in the primary language for second language learners, and use more visual learning aids. 11. Utilize collaborative, peer learning – Adults effectively learn from each other. Adults respond well when they learn from and with each other as equals, sharing knowledge, ideas and experience. When peers examine issues together, the level of discussion and learning pace is often more appropriate, according to shared experience, culture, language, age, and gender. Peers often feel more comfortable asking and clarify questions among themselves, and their explanations can be more suitable to the level and understanding of the questioner. Leaners are challenged to interpret and articulate key points, rewarding their own understanding, while helping others with theirs. Peer education can be especially effective when the learning objective involves affective (attitude) change. Provide opportunities for trainees to work in pairs or groups to share ideas and experiences, rather than being talked at by the trainer – that is, break-out discussion groups, role playing, debates, problem solving. Frame activities so they allow trainees to generalize their M&E learning experiences with each other – i.e. how support evaluation follow-up (e.g. management response) in their own organization. 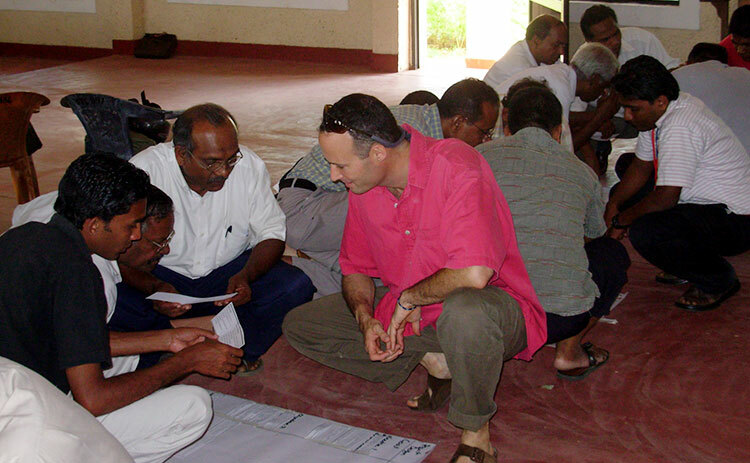 Use interactive, group activities such as problem solving, group presentations, scenarios, and roles plays – for example, create scenario cards of actual problems that may occur in M&E, such as a difference of opinion on an evaluation team, and have trainees discuss and propose solutions. 12. Include practice and repetition – Adult learning is enhanced by repetition. Adults retain new knowledge better when provided ample opportunity to review and practice. Often referred to as ‘over learning,’ learning that is reinforced by repetition is best understood and remembered. This is the basis of drill and practice; frequent attempts at recall improves retention, moving learning from their short-term to long-term memory. It also builds learner’s confidence and competence. However, the practice must be meaningful with the learner’s memory actively engaged. Therefore, it helps if it employs a variety of methods to involve the learner. The adult learner may not master each lesson completely, but repetition helps to reinforce the key learning points and skills. Lastly, repetition is reinforced with praise. Practice and review can be done many times, in many ways, for example, quizzes (which can also be used for monitoring the training), lesson summaries, review periods, and self-assessment. Build redundancy into the lesson plan, where key learning points are repeated, restated, and reorganized –reinforcing learning and providing opportunities for further clarification. Employ instructional techniques that force trainees to recall previously learned material rather than the trainer leading the review – for example, frequent and random questions. 13. Design for primacy and recency – Adults remember best what they learn first and last in sequence. The concept of ‘primacy’ is that information learned first creates a strong impression that is difficult to erase. The learner’s introduction to learning content will lay the foundation for subsequent learning. It helps to frame, organize, and set the tone of what is to follow. It is much easier to teach right initially, than to ‘unteach it later. Initial learning that is poorly designed or with incorrect content, is confusing and complicates the learning process; it also instills bad habits and impressions that are hard and time consuming to correct. Related, the concept of ‘recency’ is that information most recently learned is generally best remembered. Learning occurring last can sum-up and ’fix’ in the mind key learning points to emphasize. Recency also includes timing training in relation to when the trainees will need to apply what they have learned. Learning will be more successfully reinforced when training is timed with when new knowledge or skills need to be used. Structure essential material towards the start and end of the training when possible. Review at the end of the training and individual lessons key learning points that have been covered, and remind trainees of the sequence they have learned a topic. Accompany lesson introductions with a handout listing key learning points, and refer to this when conducting lesson reviews, visually reinforcing and organizing lesson content. 14. Provide feedback & positive reinforcement – Adults want to know if they are learning, and to be encouraged in the process. Adults learn better when they can see evidence of their progress, and identify areas to improve. Feedback should be both timely and regular. Specific feedback, whether corrective or approving, is best provided when the learning moment is immediate and fresh. Regular opportunities should also be structured into trainings that allow trainees to practice the learning and receive structured, helpful feedback. In turn, this allows trainees to monitor and take responsibility for their learning progress. Feedback should also be supportive. Adult learners like to be recognized when they performed well. Even when corrective feedback is required, it should be pitched in a positive, encouraging tone, helping to cultivate safe and supportive safe learning climate. Learning that is rewarded is more likely to be retained. As the renowned psychologist, B. F. Skinner (1974) stressed, learning is strengthened when accompanied by a pleasant or satisfying feeling, and it is weakened when associated with an unpleasant feeling. Focus feedback on what was done well, rather than criticizing what was done poorly – adults generally know (and do not need reminding) when their performance or contribution was not successful. Use group feedback opportunities that encourage peer reflection and discussion, as well as individual feedback opportunities to discuss more constructive and targeted comments more appropriate for one-on-one exchange.